This entry was posted in Baseball, Mom & Dad and tagged Vin Scully by Jackie, The Baseball Bloggess. Bookmark the permalink. Was listening to NPR yesterday but missed this interview. Thanks for sharing. Vin’s iconic voice will be missed. Nope, you didn’t miss it … it was just on this morning (Tuesday) as I was driving to my studio. I had a little break in my morning and couldn’t wait to share it with everyone. I can’t imagine baseball without Vin’s voice as the soundtrack to so much of it! Wonderful memory of your Dad and baseball! That hammock looks so inviting! Loved the interview of Vin and thinking back to the many times I have heard him interviewed or talked about – always a gentleman and baseball advocate. Thank you ! What a great post. It made me think of my grandparents in Oberon ND listening to the MN Twins games on the radio in their house. Thanks, Lisa! I remember listening to the Twins on KDLR during my teenage years in North Dakota. Often in the thick of summer, the local news guys would break into the game to announce a thunderstorm or tornado warning in the area. To this day, whenever I see the Twins I think of a tornado! Great stuff….and thanks for sharing the interview! Thanks, Gary. NPR always teaches me something I didn’t know … I never knew Vin started out as a Giants fan. For me, the “squishy memories” are always about baseball and radio. When I was a kid, in Lincoln Nebraska, you used to be able to hear the baseball games in the summer time, coming from people’s open windows, front porches and back yards. The weird thing is, I can’t remember what team we would have been listening to; it might have been the Kansas City Athletics, before the team moved to Oakland in ’67. In any case, I think of those memories as I carry on the tradition, sitting in my back yard on a late summer day (usually warm, in Oakland), with a cold beer, listening to the Giants- although, now that I’m reminded that the A’s were the team of my youth, I might have to change my allegiance, despite the team’s loathsome ownership. Radio. Baseball. Hammocks. 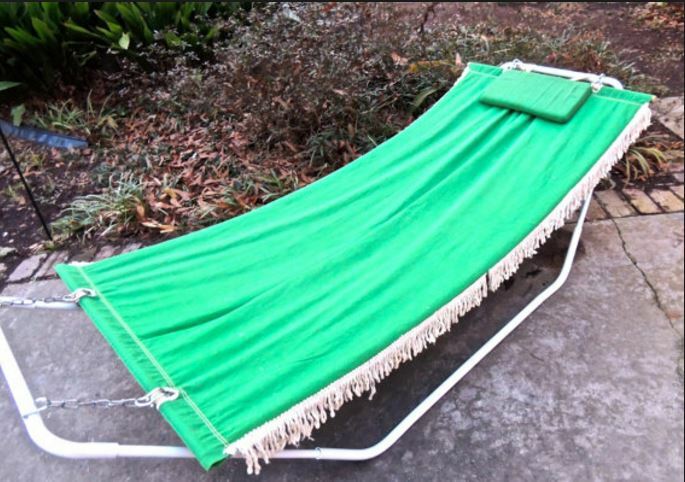 A friend saw my post this morning and wrote to tell me that her family had the exact same hammock when she was growing up in Minnesota. Apparently my squishy memory is a ubiquitous one! Ah I loved this post. I love contemplation, memories and hammocks. Thank you! I’m a big fan of hammocks (and afternoon naps), too.